Common sage (Salvia officinalis) is a hardy perennial and an easy herb to start from seed, but the seed must be fresh or the germination rate will be very low. Seedlings should be spaced at least twenty inches apart because each seedling will grow into a large bushy plant. Sage started from seed takes about two years to reach its mature size. If you want quicker results, sage can also be propagated by dividing mature plants or by taking cuttings from the outer new growth of mature plants in the fall… or by layering. 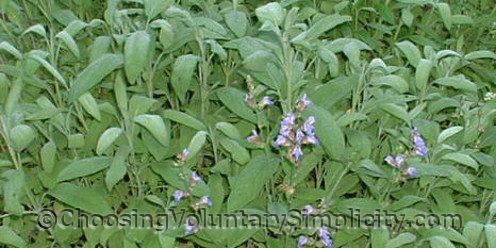 Sage plants must be pruned severely each spring. It looks drastic, but don’t be afraid to cut the plant back, because this pruning will stimulate new and bushier growth. The usual recommendation is to replace sage plants every three years, but with pruning and good growing conditions, the plants will keep thriving and producing much longer than that. I have common sage plants in my garden that are over five years old, and they are still going strong. Sage contains volatile oils and tannins as well as camphor, terpene, and salvene. The taste of sage is unique and is described by herbalists as pleasantly bitter, lemony, and camphorlike. Sage can be purchased as whole dried leaves or as rubbed (powdered) sage, but the taste of home grown sage is always so much superior. Sage leaves can be used fresh, or dried for later use. Dried sage has a much different, stronger and more pungent flavor than fresh sage, which can be used in salads and added to breads. Sage leaves dry easily… you can pick them off individually, but I do a light pruning of the mature plants throughout the summer and simply put the cuttings (stems and all) in small paper bags to dry. To retain the most flavor and aroma, I crush the leaves just before I use them. In Europe sage has long been used in baking and cooking, but in America most early uses were medicinal. Native Americans mixed sage with bear grease and used it as a salve for sores. They also used sage as a toothbrush and as a cure for bleeding gums. 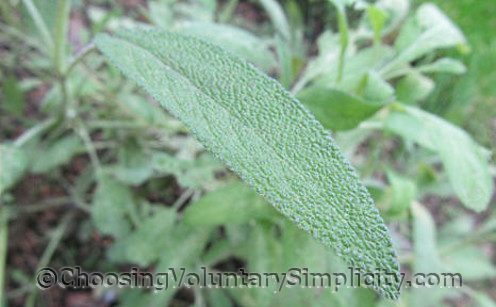 In the 1800’s, people believed that sage could cure warts, measles, and epilepsy. They drank sage tea to help them sleep and to get rid of intestinal worms. 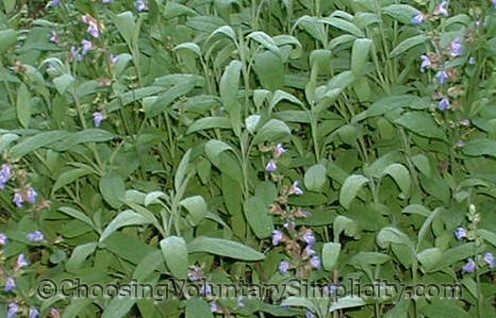 Sailors used sage to ward off seasickness. Sage has natural drying properties and was used to treat sore throats and mouth irritations and as an antiseptic and astringent. Recent research has shown that sage might be helpful in lowering the blood sugar levels in diabetics. Commercially, sage is used in many products, including cosmetics, aftershaves, perfumes, and insect repellents. When sage is used in dyeing wool, it can produce colors ranging from yellow to purple to gray green. Sage also has natural antibacterial properties and has been used as a natural preservative for meats, fish, and poultry. I have experimented with companion plantings in my garden… growing sage near carrots, tomatoes, cabbage, and strawberries is believed to stimulate their growth. Sage and onions, however, are thought to have an adverse effect on each other so I try to keep those two growing a good distance apart. I also grow other types of sage with different leaf colors. Golden sage (Salvia officinalis ‘Aurea’) has green and gold variegated leaves and is an excellent border plant because it grows only about 18 inches tall. Purple sage (Salvia officinalis ‘Purpurea’) is especially beautiful because of its deep purple leaves. Pineapple sage (Salvia elegans) grows to almost three feet tall (with red flowers), but in a very cold climate like ours it usually will not survive the winter temperatures. I treat it as an annual and start new plants each year. Most sages flower in June with tiny tubular blooms of pink, purple, white, or blue, depending on the variety. I found you after searching for a plant I couldn’t identify. It didn’t turn out to be sage but I found this article so interesting I went out and bought a sage plant and I’ve been enjoying the fresh sage in my cooking. I harvested a few leaves for drying and look forward to more next year. Thanks for all the great information here. Sage is my favorite herb — it’s so versatile and it grows so well for me in my garden. I really enjoy your articles not just on herbs and plants but the other articles too. 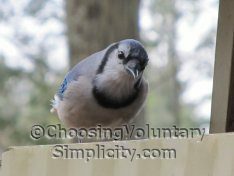 You have a point of view that I find very inspiring and I just wanted to comment and tell you that. Keep up the great work on your great blog! I had no idea that home-grown sage tastes so different from the dried sage I’ve been buying. Fresh sage is even more pungent! There will always be sage in my garden now.